I visited Oxford for the first time seventeen years ago. In 2000, Mum and I spent a little over five weeks travelling together through Europe. We started with a week in London and, having come so far with so little time, we were eager to squeeze in as much as possible. So we decided to take a day trip that covered Oxford, Stratford-upon-Avon and the Cotswolds – I know, it’s a lot to fit into one day. Oxford is a city of some 150,000+ people in central southern England and is the county town of Oxfordshire. It has played host to many significant events in English history and is also home to the University of Oxford which, as well as being the top-ranked university (according to the Times Higher Education rankings), is also the oldest English-speaking university in the world. It’s comprised of 38 colleges and six halls spread across Oxford which pretty much makes the city a wonderfully walkable university campus. And in my two and a half days, I crossed and recrossed that campus many times. Oxford is also just over an hour from London by train so mid-morning on a sunny Tuesday, I departed from Marylebone Station to arrive just in time for lunch. After something to eat and a little aimless meandering, it was time to get stuck in so I made my way to Broad Street to join a free walking tour*. L: The site in Broad Street where the Oxford Martyrs were burned at the stake for heresy in 1555. R: The green bicycle marked the meeting point for our tour. From L to R: Entrance to Trinity College; Divinity School (scenes from the Harry Potter movies were filmed inside); Entrance to the Bodleian Library on Broad Street. …and finally ‘received our degrees’ at Christopher Wren‘s first ever commission, the Sheldonian Theatre. The Sheldonian Theatre is on the left of this courtyard which is accessed by walking through the Bodleian Library entrance in the previous photo. All Souls College – a prestigious research-only college (no under-graduates here!) – and the Radcliffe Camera (another part of the Bodleian Library complex). Interior views of the University Church of St Mary the Virgin, the original site of all of the university’s teaching and administration. …before entering the grounds of Christ Church College for a few final stories. I parted with Tom and the group on the banks of the River Cherwell delighted with my re-introduction to Oxford. And inspired by the mild weather, I decided to take a solitary walk around Christ Church Meadow. It was gloriously peaceful and exactly the tonic I needed. The River Cherwell where Charles Dodgson aka Lewis Carroll first regaled the Liddell sisters with tales of Alice’s Adventures in Wonderland. View of Christ Church from across the meadow. ‘Tis the season…for harvesting the hay. It’s just as well because over the next two days, I packed a lot in. I spent time at three different colleges during my stay – Christ Church (well, in the meadow anyway), Merton and Magdalen. I indulged my lust for literature with a tour through the Bodleian Library, a visit to Blackwells’ Bookstore and its Norrington Room and a delicious meal at the Old Bookbinder’s Alehouse tucked away in Canal Street, Jericho. I satisfied my urge to rummage around in history with a couple of hours at the Ashmolean Museum. And, as I am wont to do, I did a whole lot of wandering about. * A note on free walking tours: When I arrive somewhere that I am unfamiliar with, I find one of the best ways to get my bearings is to join a walking tour. A lot of cities offer free walking tours – you just turn up at an advertised time and place to meet your guide. The guide usually asks for a contribution at the end of the tour – the amount is your choice and you are free to pay something or not. It’s up to you. I’ve done these free walks in several cities and having found them really excellent, always find something to give…Tom got a fiver. The story so far: Inspired by the success of my trip to York in March, at the beginning of June I was off for another mid-week staycation, this time to Edinburgh. I had heard many good things about visiting the city and was looking forward to a few days exploring. After boarding at London’s King’s Cross station on a busy Monday morning, my seamless and comfortable train journey to Edinburgh’s Waverley Station took just under four and a half hours. This post is the second of three and is designed to be an armchair tour of my brush with Edinburgh’s literary fraternity. Those of you that know me even a little will know that I love to read and there are a host of literary links in Edinburgh from Sir Walter Scott, J.M. Barrie (Peter Pan), Arthur Conan-Doyle (Sherlock Holmes) and Robert Burns (he of Burns night) – right through to modern masters like Ian Rankin (Inspector Rebus), Alexander McCall Smith (the No. 1 Ladies Detective Agency) and J.K. Rowling (Harry Potter). Sir Walter Scott is a big deal here – he wrote Rob Roy and Ivanhoe, neither of which I have read, but there were quotes everywhere in the train station and when I emerged onto Princes Street, there was a stonking great monument to the bloke just down the road. You’ll also find Scott at The Writers’ Museum – along with two other Scottish wordsmiths – Robert Burns and Robert Louis Stevenson – and on my last day I spent about an hour here admiring the personal effects, checking out the photos and reading about the lives of these famous men. After three days in Edinburgh, I hadn’t found very much that paid tribute to another well-known literary Scot – Arthur Conan-Doyle who invented one of the world’s most famous detectives, Sherlock Holmes. Luckily Allan Foster’s Book Lovers’ Walking Tour plugged that gap and at one o’clock we met outside the museum and ventured off into yet another downpour. Heading to the south side of the city, we entered Conan-Doyle territory with a couple of stops at the College of Surgeons – where as a student, he found the inspiration for Sherlock Holmes in Joseph Bell – and his local drinking hole, Rutherford’s Bar. The bar was also a favourite of Robert Louis Stevenson and the restaurant that occupies the building now is called The Hispaniola in a nod to Stevenson’s most famous novel, Treasure Island. It was an interesting, behind-the-scenes sort of 90 minutes and pretty easy walking in spite of the weather. Allan’s knowledge covered so much more than I would have discovered on my own so I’d recommend this walk if you are even remotely bookish. There are also quite a few eateries with literary links in Edinburgh and I particularly enjoyed The Queens Arms in Frederick Street (New Town) and the Deacon’s House Cafe off the Royal Mile in the Old Town. I also visited The Elephant House whose claim to fame was as the ‘birthplace of Harry Potter’, it being claimed that J.K. Rowling used to frequent the cafe when she was writing the books. It was well-appointed and spacious but I was underwhelmed by the service and food. It’s been over a month since my last historic meander so I am pleased to report that yesterday I spent a couple of hours weaving through the City’s streets in an effort to discover more about London’s connections with slavery. …a picture of Britain is noticeably absent. So yesterday I met with Museum of London guide Mike (yes he of my Roman fort tour earlier this year) and along with about twenty others, embarked on Sugar and Slavery, a two hour walking tour around the key British institutions involved the slave trade. From our meeting point at the museum, we walked down Noble Street, pausing opposite the Goldsmith’s Company for Mike’s introduction to the slave trade, before heading down Gresham Street to Guildhall Yard. Entering Guildhall Yard from Gresham Street – the Yard is built on the site of the old Roman amphitheatre. The guilds were organisations that represented the wide variety of trades – and as such controlled the various industries – operating in the City of London. In the 17th century, Guildhall was the central seat of justice for the guilds and many a legal battle was fought in Guildhall itself. Guildhall continues to be the administrative and ceremonial centre for the one square mile that constitutes the City of London. I remember watching Stephen Fry’s Key to the City a couple of years ago where he explored what it meant to have been awarded the ‘Freedom of the City’. He also attended a banquet here – it still seemed full of tightly-held traditions and much pomp and ceremony. …to reach Bank Junction where we stopped outside the Royal Exchange. The Threadneedle Street entrance to the bank loomed above us on one side and Mansion House, the official residence of the Mayor of the City of London stood across the traffic circle in front of us. Mansion House, official pad of the City’s Lord Mayor. No that’s not Boris Johnson – he’s the Mayor of Greater London which does not include the City. The current – and 688th – Lord Mayor of the City of London is Jeffrey Evans. The Royal Exchange, founded by Thomas Gresham in 1565, operated much like today’s stock exchange – albeit without the technology – with traders and the city’s financial pundits going at it hammer and tongs from the opening to the closing bell. However, there was a point when it was suggested that business dealings should be negotiated outside the Exchange and so the emergence of coffee houses began. You may be wondering what this all has to do with slavery – well, everything. Slavery underpinned the British economy and pretty much allowed rich men to get even richer. Mike told us about one such man, David Lyle, an ‘absentee’ plantation owner who was also, by all accounts, a cruel master. It is recorded that Lyle pistol-whipped one of his slaves, Jonathan Strong and left him for dead on a London street. Strong was found by Granville Sharp – one of the first campaigners in Britain for the abolition of the slave trade – who nursed Strong and offered him work. Legal battles ensued between Sharp and Lyle (once the latter learned that Strong was alive) with the Lord Mayor eventually pronouncing that Lyle had no claim as Strong was not ‘property’. This was the very same institution who legislated that slaves on ships could be thrown overboard – like possessions – should the captain believe his crew were in danger (eg. of starving due to provisions running out) and also supported the traders’ insurance claims to redeem losses from such activities. The buying and selling of slaves moved out of the Royal Exchange (officially) and into coffee shops. The Jamaica Wine House (nee Coffee House) stands on the site of London’s first coffee house. The importation of raw materials such as coffee and sugar flourished with this rise of informal ‘trading houses’ and a young West African could have his or her horrific fate sealed over this bitter brew sweetened with sugar. We paused on Lombard Street near the Church of St Mary Woolnoth to hear about John Newton who, after years of trading and torturing slaves, reformed and became rector here in 1780. He gets a mention from me because along with poet William Cowper, he composed a book of hymns in the 1770s – the most famous of these ‘Olney Hymns’ was Amazing Grace…and I cannot tell you how many times I played that as a child when I started learning each of the recorder, clarinet, flute and violin. We headed on past the Monument (that’s the one to the Great Fire of London) and down to the riverside by Old Billingsgate, Mike continuing to paint a picture of the sickness and fear that these men, women and children who’d been torn from their loved ones, faced firstly on-board the slave ships then upon their arrival, where they’d be poked and prodded like animals before being sold, and finally in being ‘seasoned‘ on the plantations of Barbados and Jamaica. Our next to last stop was Lloyd’s of London, a towering metal edifice of power and money. The original Lloyd’s of London was a coffee house in Lombard Street and as well as playing host to the wheeling and dealing of London’s businessmen, became known as a place where one could obtain marine insurance – much like it is today. That the slave trade was conducted across the Atlantic suggests that Lloyd’s too has its roots steeped in the horrors of human trafficking. Just down a nearby alley stands the Gilt of Cain, a memorial to the abolition of the slave trade in 1807 that was erected in 2008. It was a fitting way to end the tour. I walked thoughtfully back to the tube station, comparing what I’d seen in movies with the stories of the people who perpetrated, fought and suffered that I’d just heard. There was so little humanity and dignity in each of the different stories that Mike had shared. Some of this I recalled as I walked but in essence, it felt like a fraction of the full story. There’s a part of me that wants to learn more. While I’ve seen 12 Years a Slave – and found it viciously confronting – somehow each tale told over the two hours of the walking tour left more of a mark. I’m travelling to Liverpool next week, the largest of the old slave trading ports and home to the International Slavery Museum so it is a perfect opportunity. But it also feels a bit raw – I feel appalled, my belief in the human spirit dented a little so while I will make the most of the educational opportunity that Liverpool will afford, it may be a little while before I venture into anything more. Those of you who are Gidday regulars will know that I like a walking tour. I got into them in earnest last year, thinking they’re a great way to indulge my passion for history. We were also doing the Get the World Moving challenge at work and one’s step count, and increasing it, became the currency of water cooler and photocopier conversations for about three months. Yesterday I joined Museum of London guide Bridget and twenty committed tipplers for a damp and chilly trawl through London’s links with gin. Here’s how things went. We began outside the Dominion Theatre on the corner of Tottenham Court Road and New Oxford Street, the site of the old Horseshoe Brewery and the great beer flood of 1814. Apparently a large vat of porter burst and flooded the area. With many of London’s poor living in nearby tenements and cellars – Bridget quoted 102 people living in 8 rooms – it’s remarkable that only eight people died. That six of them were at a wake brings new meaning to the saying “drowning one’s sorrows”. 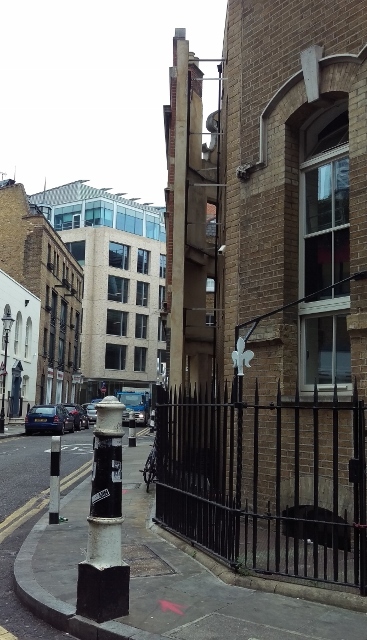 Our next stop was Denmark Street – London’s music mecca – Central St Giles (designed by Renzo Piano, the architect behind the Shard) and the church of St-Giles-in-the-field. Here the enormity of gin’s impact on London really took shape. Gin, or jenever, came to London from Holland, introduced by William III who had seen its invigorating effects on his troops in the face of battle. Ever heard of the expression Dutch courage? In any case, gin was easy to make and accessible to the poor and at one stage, every man, woman and child was consuming 500 gallons per year – that’s more than 2,270 litres if you are metric – or 6 litres per day. As such gin became the root of many social ills, some of which were illustrated by William Hogarth in his etchings below. Thuggery, thievery, disease, suicide and murder were all part and parcel for the gin drinker (right) while on the left, beer was being positioned as having a less deleterious effect on the health (see the better dressed fishwives at the front of the picture). The ‘powers that were’ agreed – after all, without the poor masses, who would serve them and fight their wars – and passed several Gin Acts in an effort to stem, not always successfully, gin’s rapacious tide. We continued around the back of the church and down to Seven Dials, originally the nexus for just six streets rather than the seven of today. The area was laid out by MP Thomas Neale in the 1690s to maximise the space available for his housing project. He commissioned Edward Pierce to build a sundial to stand in the intersection but this was destroyed in 1773 in an effort to stop the site, which was showing the effects of the residents’ heavy gin consumption, being a meeting place for ne’er-do-wells. In the late 1980s, it was rebuilt in line with the original plans and in keeping with our Dutch association, it was Queen Beatrix of The Netherlands who attended its unveiling as part of the year-long William and Mary celebrations in 1989. 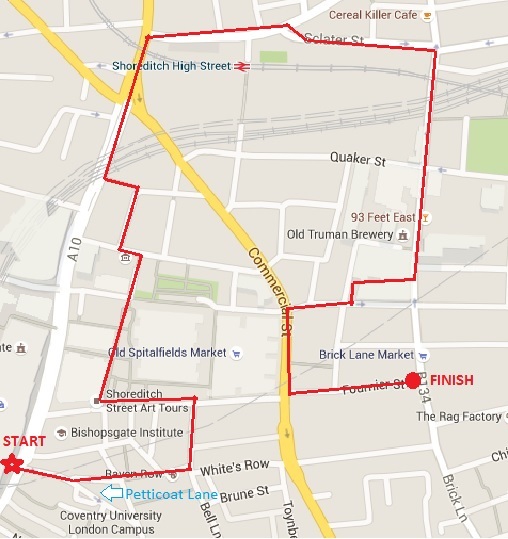 We set off down Earlham and then Neale Streets to find ourselves at Covent Garden. We paused by the back entrance to the Royal Opera House to learn about Harris’s List of Covent Garden Ladies. The list was published between 1750 and the mid-1790s and detailed the attributes and services of each ‘lady’ available in Covent Garden alongside her picture – at one point, 8000 copies were in circulation. Much business was also done under the portico of the church opposite, the site of Tom King’s coffee shop which was a place not only for coffee but for gambling and drinking as well. It was said that gentlemen emerging from their clubs could ask Tom (and later Moll King) for the services of lady from Harris’s list. A messenger would be despatched and the lady brought to the coffee shop to meet said gentleman. 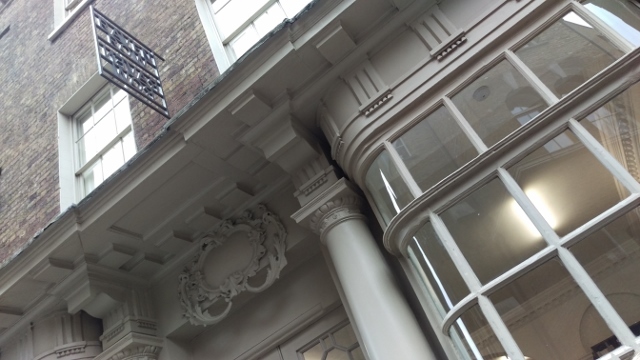 We walked around the block and into Bow Street – I’ve only ever entered the Opera House from Covent Garden so I was delighted to acquaint myself with its front. The BAFTAs ceremony for the film awards – said to be an indicator of Oscars success – is held here every year on February 14th so there was a lot of work going on to prepare the ‘red carpet’ for tonight. We turned into Broad Court and paused again to hear more about Henry Fielding, his brother John and the Bow Street Magistrates Court where people like Casanova, Oscar Wilde, suffragette sisters Emmeline & Christabel Pankhurst and author Jeffrey Archer have appeared. Henry Fielding also established England’s first police force, originally a group of just six men nicknamed the Bow Street Runners, in 1749. The end of Broad Court brought us out onto Drury Lane, where many gin palaces emerged during the 1800s. These ‘palaces’ employed the latest inventions of the 1830s – gas lighting, silvered mirrors and paned glass windows – to create a brighter and more genial environment to enjoy a tipple although without seating, patrons drank until they could no longer stand. Literally. Taverns (where beer was served) already had seating so watched, learned and called on the same improvements to provide a much more comfortable environment for their patrons. So the public were drawn back into the taverns and away from gin until the first half of the 1900s when in the roaring 20s and then again during World War II – when it was Churchill’s tipple of choice – gin’s public profile rose again. …but there was still one more stop to make before our promised refreshment. …and encouraged us to duck into the side door to have a quick peek at how the taverns of the 1830s (and onwards) might have looked. While it was just a short peek, it was really beautiful and inspired me to find a reason to come back for a drink with friends. Just as well that our final stop and gin-watering hole was not far away. And so our tour ended at The Ship Tavern, tucked away behind Holborn Underground Station, with a rather lush gin, grapefruit and coconut concoction. …but these streets really came to life yesterday with guide Bridget’s extraordinary knowledge and skillful storytelling, only a fraction of which I’ve shared with you here. The museum runs a number of themed walking tours like this so if you are interested, check out the website. The next Mother’s Ruin tour looks like it’s on March 13th so if I were you, I’d get your skates on (another Dutch reference – see Hans Brinker) and book your place. It’s bound to be the perfect tonic. 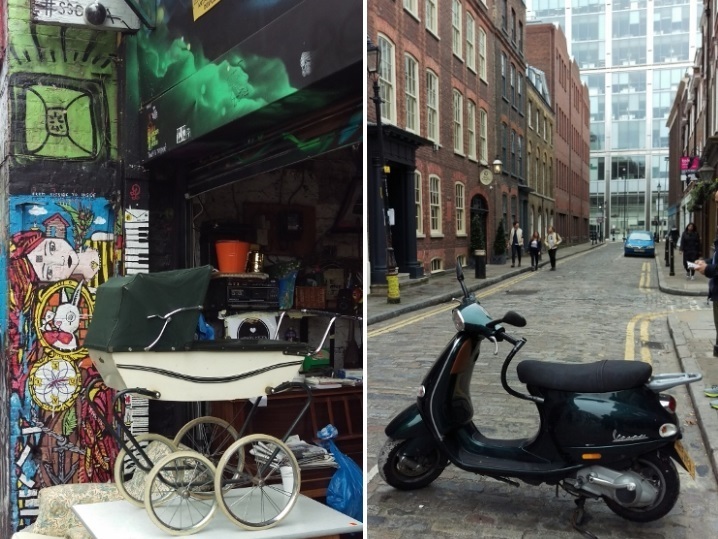 I love discovering London’s hidden stories and last Saturday I joined Blue Badge Guide Paula Cooze to discover to the story of Spitalfields. It’s not the first time I’ve ‘toured’ with Paula, having started my fan-dom in September 2013 in the shoes of Matthew Shardlake followed by an architectural wander around the City four months later and then an amble around the Globe mid 2014. So you can see that it’s been some time since a missive from Paula has found its way into my inbox and it was perfectly timed as Spitalfields is an area I brushed past earlier in the year and I have been itching to do ‘more’. Wave after wave of immigration has shaped this gritty pocket of London and what was once slum housing and dangerous streets, has become regarded as one London’s places to be. 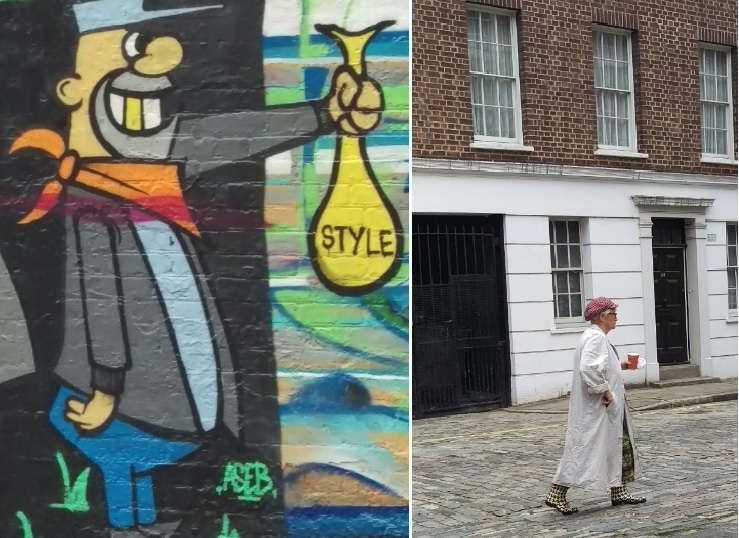 In fact the gentrification of Spitalfields is fostering considerable debate and even protest, the most recent being the attack on the Cereal Killer Cafe at the top end of Brick Lane in September. It’s a part of London bursting with expression, riven with side streets and alleyways and clothed in a patchwork of colour and smell. I was so excited that, in babbling on about it to friends after I’d booked my place, I actually inspired a couple of them to come along. Spitalfields was named for the priory of St Mary Spittel, founded in 1197 in a field right next to the site of the current market. The area lay just outside the walls of the City of London and attracted many merchants and craftsman who were not part of the restrictive City Guilds operating inside the walls. 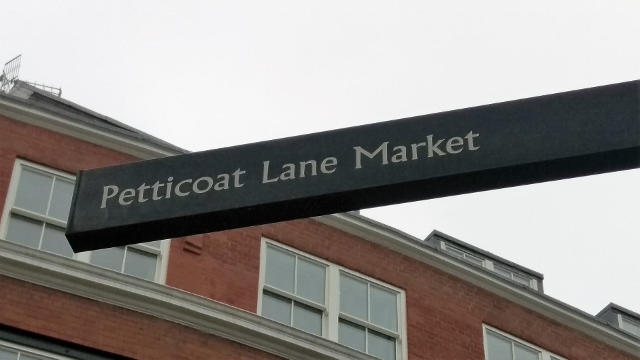 The multicultural history of Spitalfields is steeped in the ‘rag trade‘ and a fitting place to start our trip down memory lane was with a visit to Petticoat Lane. This street – now called Middlesex Street – was home to many Spanish immigrants in the early 17th century and although the famous market was only formalised in the 1930s, it has always been the place to come for cheap, second-hand clothing. The Huguenot silk weavers arrived in the late 1600’s to capitalise on the area’s burgeoning reputation as a garment district and were followed in the early 1800’s by the Jews fleeing the pogroms in Russia. Both fled persecution with little but their trade and so their sewing machines were a life-line, the only way for them to earn a living and survive each day in this then slum-ridden part of London. 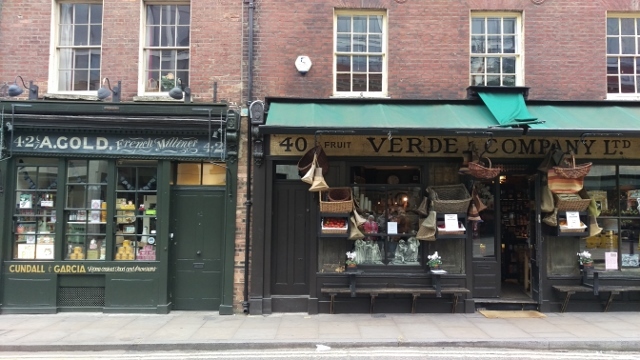 This beautifully preserved silk weaver’s shop and residence in Raven Row is now an art gallery so you can take a wander through to see how the more affluent lived in the past and how the locals are expressing themselves today. 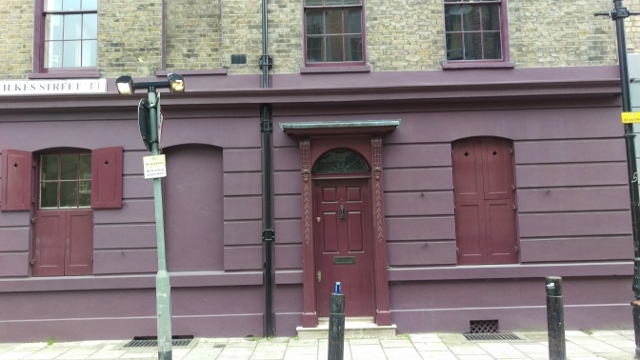 When we turned around from the silk weaver’s windows, Paula pointed out this controversial facade running along the back of Lilian Knowles House. We headed down Artillery Row – the name a nod to King Henry VIII’s gifting of the area to the military during his reign in the 16th century – turned left into Crispin Street and passed alongside the Providence Row Night Refuge (now called Lilian Knowles House). It was here that Paula added yet another immigrant community to her story – the Irish, arriving in the mid 1700’s with their dreams of escaping the potato famine in Ireland to build a brand new life in America. The majority could not afford the dream and so stopped where the money ran out – in London. …and with a quick left down the alley at the end of Blossom Street (the most inappropriate name for a street ever), we emerged at the bottom end of Shoreditch High Street. Ambling along Bethnal Green Road and back down to Brick Lane Paula explained to us a little about the street art scene. 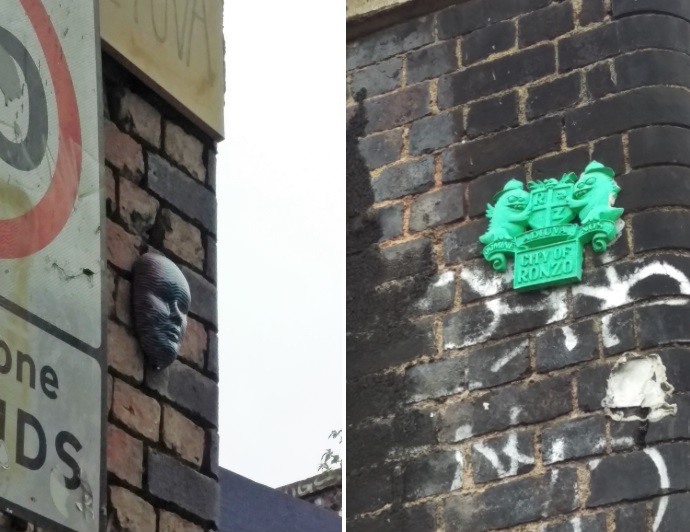 This commissioned street art adorns a local locksmith on Bethnal Green Road. That’s the entrance on the right painted as the opening of a vault. Nice to see two of my favourites from my walking tour through Shoreditch in June – Gregos on the left and Ronzo on the right. Life imitating art? Or is it the other way around…. Street art frames transportation for the young…while this Vespa was one of many I saw, perhaps appealing to the young at heart? After cutting through the Old Truman Brewery complex and along Commercial Road (this is the side of Spitalfields Market that has had its original facia preserved), we made our way down Wilkes Street – where Keira Knightley‘s pad is up for sale – and into Fournier Street. 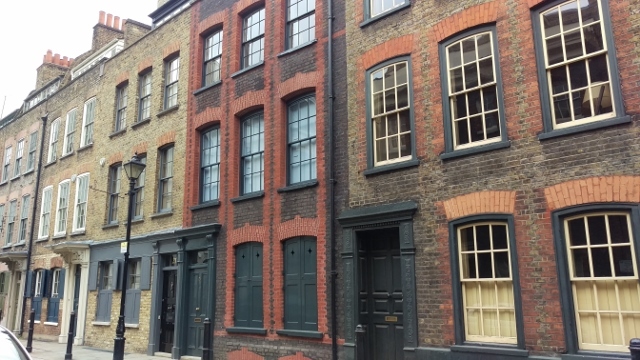 Wonderfully preserved buildings along Fournier Street. And it’s here that Paula told the last of her stories and bade us all farewell. Another great tour from Paula – done. 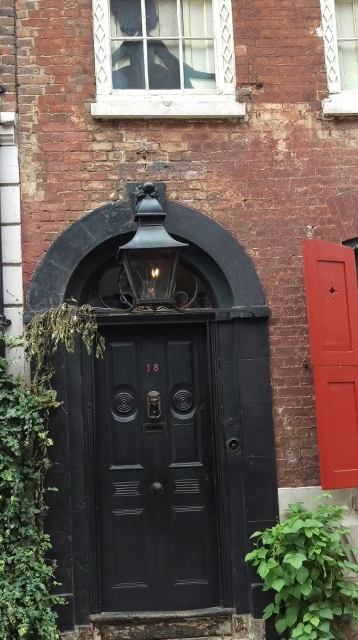 So I’d really encourage you to have a look around the area for yourself – I’ll be checking out a visit to Dennis Severs’ house to really immerse myself in history. But really, to get the full story, you’ll have to wait – perhaps patiently – for the next time Paula crosses the city.